Home | Roofing Information | Does Metal Roofing Require A Roof Deck? 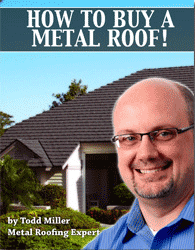 Does Metal Roofing Require A Roof Deck? We just built a 16’x16′ shed, that will be converted into a guest house in a year or two. Our contractor installed a metal roof, but he put it directly on 2×4’s attached to the rafters, as opposed to installing on a roof deck. The 2×4’s are 3 1/2 feet apart in some places. There is no vapor barrier or underlayment. When inside the building, we see metal and wood (and sunlight) when we look up. Is this the proper way to install the roof, especially when we know we will convert it to living space? Do we need the vapor barrier and decking? I don’t know the pitch of the roof, but it is steep. Like a barn roof. Just to make this story interesting, just days after he finished the building, we had a very strong storm. The wind caught one of the panels and blew/rolled it over to the other side, almost like a sardine can. Needless to say, it is ruined. So now we wonder if we need to remove the whole thing and start over. Most metal roofing manufacturers, for this application, will suggest decking and underlayment. You may get by with just venting the attic well and putting a vapor barrier behind your ceiling. You could also spray the entire attic cavity with polyicynene insulation. I was very interested in all your comments about metal roofing.We are in the process of buying our home, it has shingles, but I’ve always lived in a trailor and love the sound of the rain.We decided to re roof using metal. Will I be able to hear the rain through the shingled roof and the metal roofing? Probably not. Perhaps from an open window you might hear a bit of what you’re seeking. Ultimately it depends a lot upon the profile of the roof you install as well as on exactly how it is installed.